Betty Mark, a sophomore at Shepaug Valley School, helps make Hearts of Hope as part of the inaugural Washington Gives event to commemorate Martin Luther King Jr. Day. WASHINGTON — Erik Gustafson hunched over a black canvas adorned with a quote from Martin Luther King Jr. in silver and drawings and phrases in neon shades. Gustafson, a sophomore at the Gunnery, paused from outlining with his neon green paint marker to reflect on what the quote at the top, “Life's Most persistent and urgent question is: What are you doing for others?” meant to him. “It makes you think about what you’re doing to improve people’s days and make other people’s lives easier,” he said. 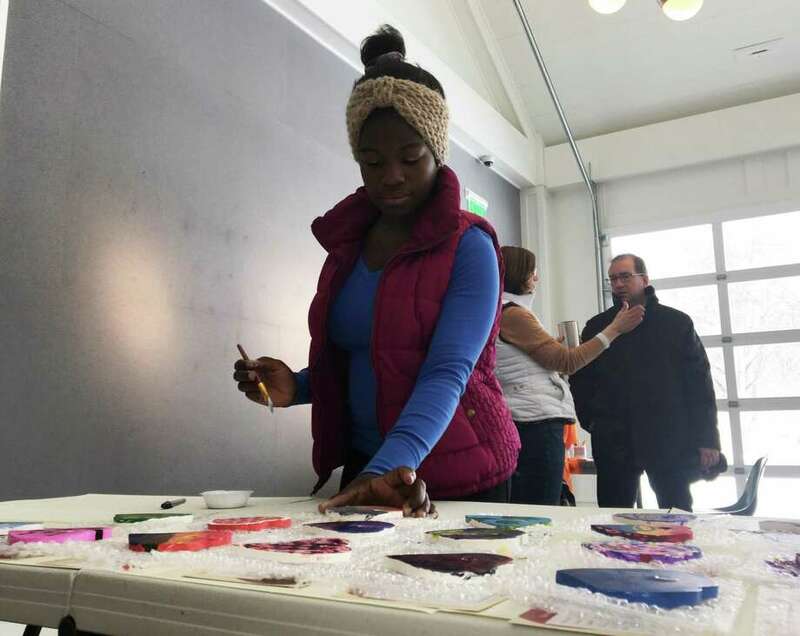 The mural was only one of the many ways businesses, students, civic organizations and the town were celebrating Martin Luther King Jr. Day with the inaugural “Washington Gives” event. Throughout the day, service projects, collections, presentations and programs were held around town to commemorate the life, works and spirit of Martin Luther King Jr.
Martin Luther King Jr. Day became a federal holiday in 1983 to honor the civil rights leader. Congress expanded on the holiday in 1994 to make it a day of service. Washington’s event evolved organically. The Washington Business Association had been wanting to showcase the town’s nonprofits more and when the members learned of the national service day they thought it would be a good fit. The Gunnery, which has participated in service projects on this day for years, reached out this fall to get involved and suggested previous successful projects. “Everyone jumped on board,” said Lisa Stein, president of the Washington Business Association. The single-digit temperatures and icy roads may have prevented some people from coming out, but Stein said the event helped get the word out about what the Washington nonprofits do. She said they plan to build on this event for next year and to offer other service days throughout the year. She said its great that the day is set aside to honor King and celebrate his legacy with service. Volunteers at the Judy Black Memorial Park and Gardens also painted Hearts of Hope that will be given to Social Services. Churches and nonprofits will be able to distribute the hearts to help uplift the spirits of those in need. Drew Sutherland, a sophomore at the Gunnery, said the Hearts of Hope he and the other volunteers were painting helped embody a message King shared throughout his life. He said King never got to see how he changed the world but knew that he did. Sutherland said that even though they won’t get to see those who get the hearts, they still know they are sharing a message of hope and helping others.